The Warriors are victorious 2 years in a row! Zimbabwe’s 6th #COSAFACup trophy! 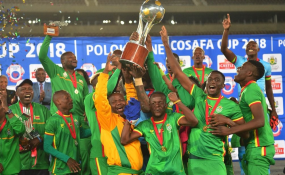 THE qualification of five COSAFA countries for the 2019 AFCON finals has given a new dimension to this year's COSAFA Cup with the countries hoping to use the regional tourney to prepare for their Egyptian battles. For the first time in 21 years, COSAFA region will send their largest pool of representatives to the finals of the Africa Cup of Nations. Five teams from the bloc confirmed their places at the end of a long qualifying campaign at the weekend. It has also emerged calls are being made for Zimbabwe to review its decision not to host the tournament. Zimbabwe could be fined heavily, more than what it costs to host the tournament, while the Warriors could be banned from the COSAFA tournament. COSAFA president, Philip Chiyangwa, has congratulated the five sides from the region -- Zimbabwe, South Africa, Namibia, Angola and Madagscar -- who will be at the AFCON finals. "We are immensely proud of the teams from our region who will fly the COSAFA flag in Egypt and believe this shows the growing strength of football in Southern Africa," Chiyangwa said. "We believe this is a direct result of the work we at COSAFA have been doing at senior and junior national team level to help develop players in the region and give them exposure on the international stage. "Players who have been unearthed in our Under-17 and Under-20 tournaments in the last few years are now stars of their senior teams and that is the exciting pathway that COSAFA MA (member associations) provide. "We wish all the teams the very best at the finals in Egypt and also commiserate with those who came close to qualification, but narrowly missed out." Youth, Sport, Arts and Recreation Minister, Kirsty Coventry, saluted the Warriors. "The team has done so well, the amazing crowd got them going in the first half, especially, and I would like to thank them for that. "It was very special and a huge honour for us to be supporting the boys and they played with pride. "I think going forward, just keeping the team together as much they (ZIFA) can, is important. "They were playing so well together and they were reading each other very well, they had the best possession. "I think if they can keep the mentality of the team positive and let them ride over this we should do well," Coventry said. Goalkeeper George Chigova was excited by the Warriors' brilliant run and the prospects of featuring at the tournament, for his first time in his career, after missing out at the 2017 edition in Gabon. "It's amazing, we came a long way in these qualifiers when we started off against Liberia at home and we were on top of the table from the first game.